If you have ever adored the heroic majesty of a horse, you will definitely love this Celtic inspired horse head pendant necklace. 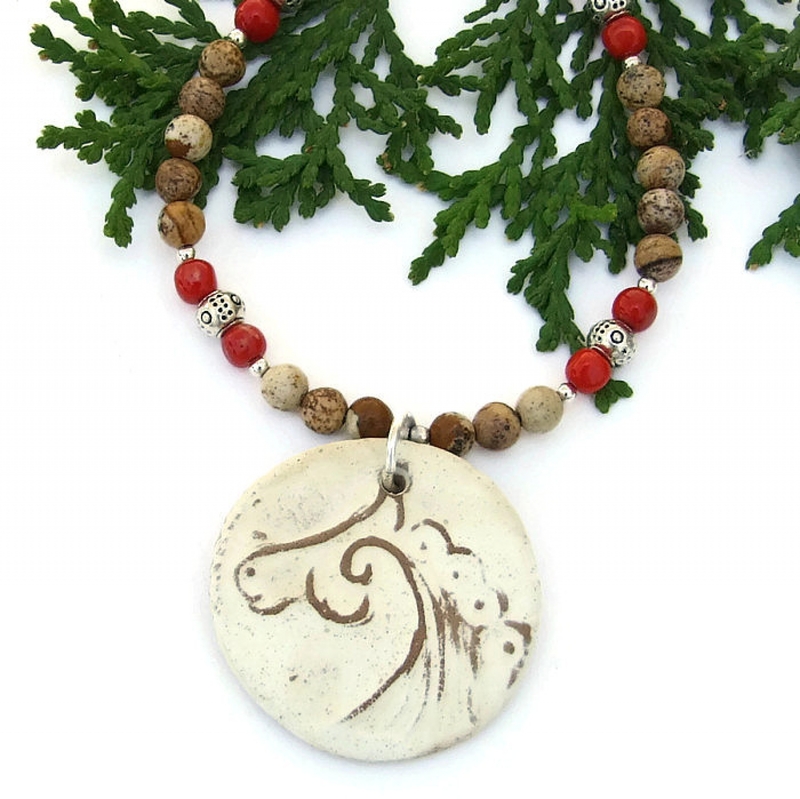 The star of the handmade necklace, called CAPALL CROGA (Irish Gaelic for "brave horse"), is a one of a kind artisan stoneware horse head with spiral pendant. 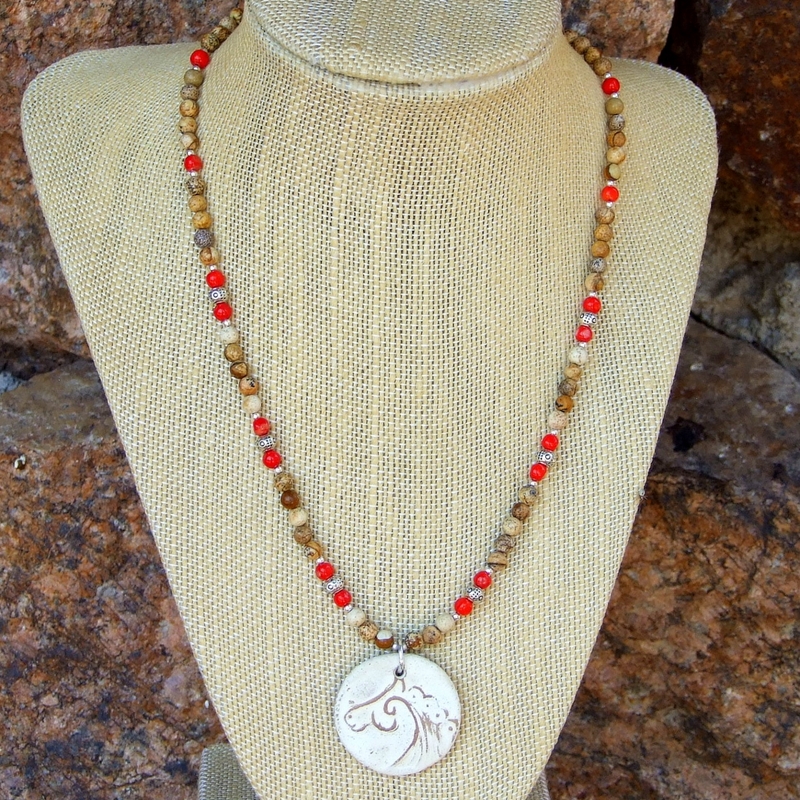 The pendant is perfectly complemented with earthy landscape picture jasper gemstones, red coral, pewter evil eye beads and sterling silver. 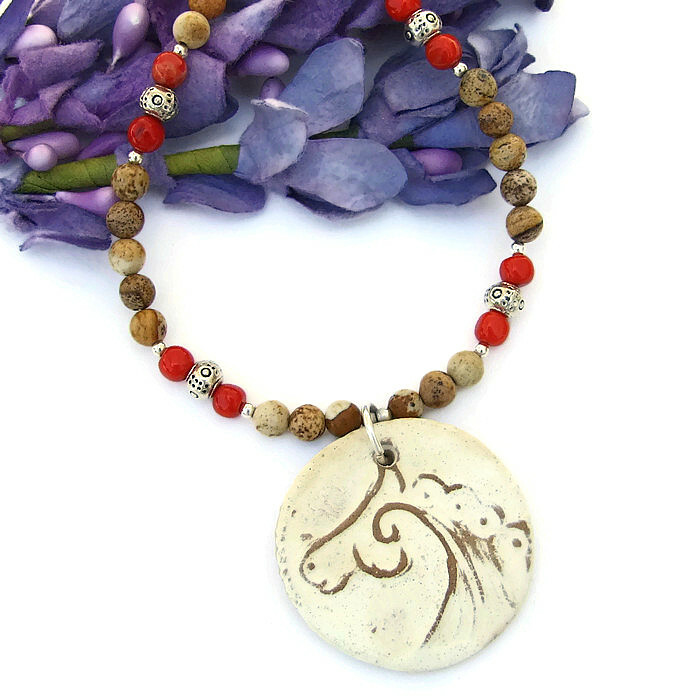 A rustic, sublime beauty, the necklace is a lovely addition to your unique jewelry collection or a perfect gift for a horse crazy friend. The CAPALL CROGA necklace was carefully designed and created by Catherine of Shadow Dog Designs. *** For a better understanding of the relative size of the Celtic horse head pendant and other elements used to create the in the CAPALL CROGA artisan necklace, please be sure to check out photo # 6 for a size comparison with a quarter. 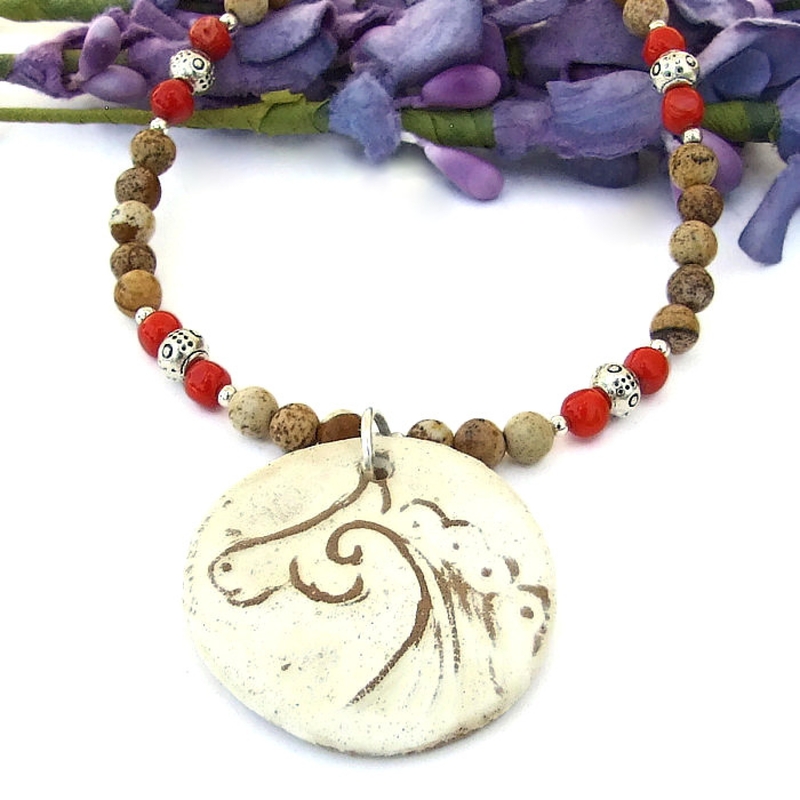 The rustic, Celtic inspired horse head stoneware pendant is a one of a kind piece which was handmade by ceramic artist, Christine of Beadfreaky. Christine makes her own molds, transferring the desired design into clay from the molds. The flowing lines of the horse’s head are accentuated with the addition of a spiral, a meaningful symbol that is commonly found in a large percentage of Celtic art. A matte white glaze was applied to the front. When fired at high heat in a kiln, the glaze settled to the background of the pendant. The curving raised lines of the horse’s head are accentuated since the natural tan color of the stoneware shows through. The backside of the pendant was left unglazed. High fired ceramic stoneware is very durable, but, if hit on something very hard, it can chip or break. The pendant was attached to the main body of the CAPALL CROGA necklace with a heavy gauge sterling silver jump ring. 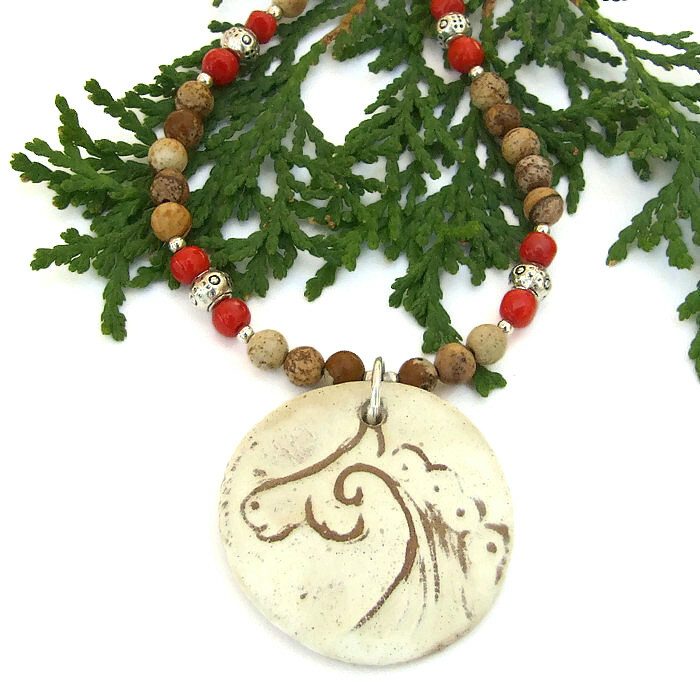 To highlight the colors of the horse head pendant, natural landscape picture jasper was chosen. As you can see in the photos, the beautiful gemstones range in shades of color from a very pale tan to a reddish medium brown, all with dots and blotches of various earthy colors that this jasper is famous for. 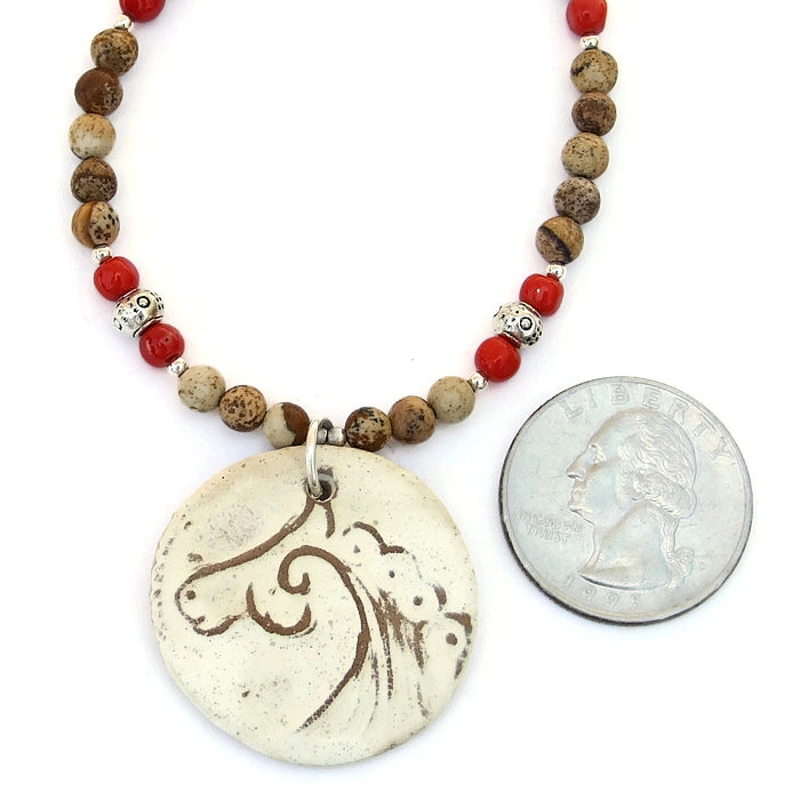 Two vibrant red coral rounds and sterling silver beads separate each grouping of jasper in the front of the necklace. A single pewter bead with a protective evil eye design was placed between the first three groups of red coral. 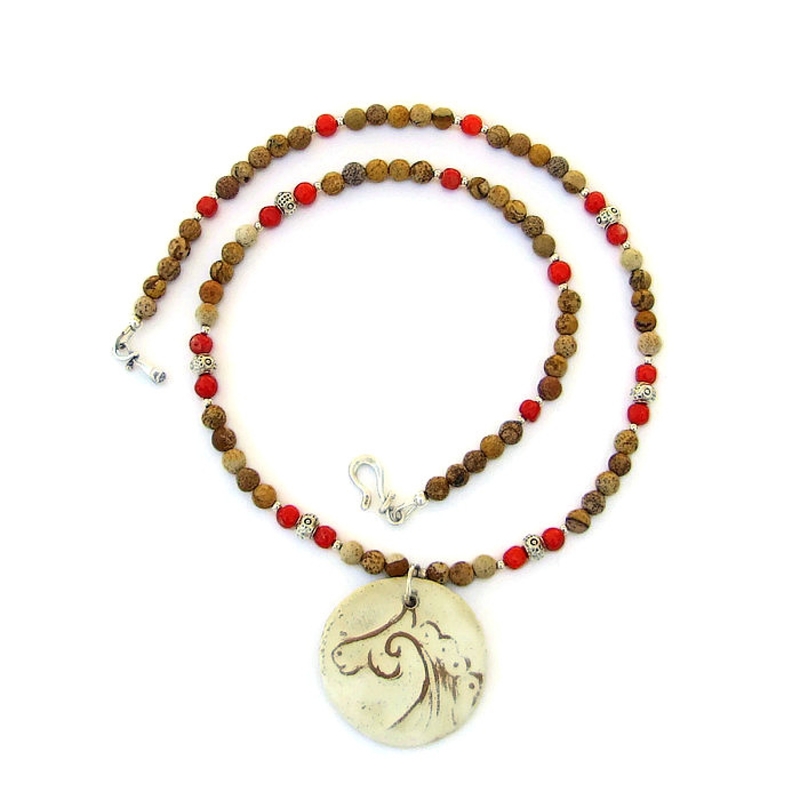 One red coral bead separates the jasper in the back. A unique sterling silver hook clasp set finishes the eye catching CAPALL CROGA horse pendant necklace. The horse has long been a symbol of power to most cultures and are believed to symbolize strength and vitality and the ability to overcome obstacles in life to pursue goals no matter what may stand on the way. Landscape Picture Jasper is said to be a stone of harmony and helps with the re-evaluation of life’s issues. Red Coral is said to calm life, to restore harmony in the event of an emotional conflict. Pewter is believed to be very grounding, bringing the wearer back to reality. Silver is a metal of love and healing; it is a mirror to the soul, helping us to see ourselves as others see us. 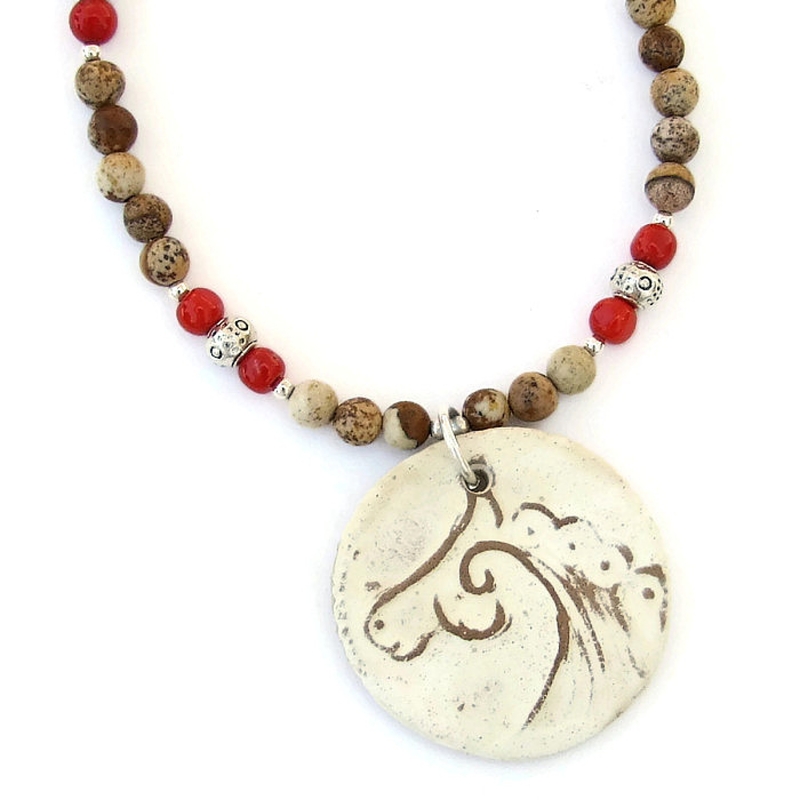 The CAPALL CROGA horse pendant necklace was carefully designed and handmade in a dog friendly, smoke free studio. The necklace will come with two informational drop tags: one with the piece's name; the other lists the materials used in the necklace and the language of the stones and metals. It will be carefully packed in an organza jewelry bag, perfect for gift giving to a loved one . . . or to yourself!